With Twilio's Autopilot, you can build messaging bots and virtual voice assistants powered by Node.js and Twilio's own Natural Language Processing engine. In this quickstart, we're going to build a simple voice assistant that can tell a caller a joke if they ask for one. Not a developer? Check out the console-only version of this quickstart! Before you can build a virtual assistant with Twilio, you'll need to sign up for a Twilio account or sign into your existing account. For this quickstart, you'll also need a Twilio phone number that's capable of making calls. You can sign up for a free Twilio trial account here. When you sign up, you'll be asked to verify your personal phone number. This helps Twilio verify your identity and also allows you to make calls to your phone from your Twilio account while in trial mode. Once you verify your number, you'll be asked to create a project. For the sake of this tutorial, you can click on the "Learn and Explore" template. Give your project a name, or just click "skip remaining steps" to continue with the default. Once you get through the project creation flow, you'll arrive at your project dashboard in the Twilio Console. This is where you'll be able to access your Account SID, authentication token, find a Twilio phone number, and more. If you don't currently own a Twilio phone number with Voice functionality, you'll need to purchase one. 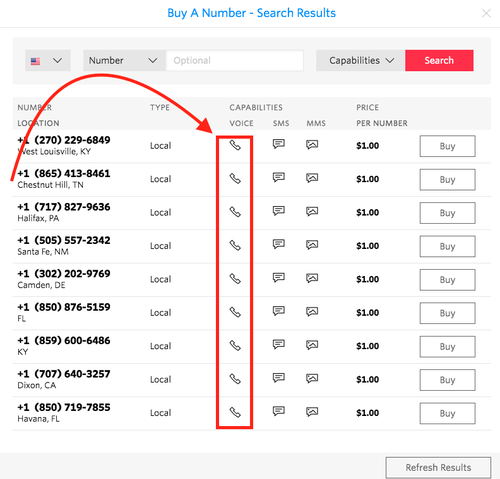 After navigating to the Buy a Number page, check the "Voice" box and click "Search." Now that you have a Twilio account and a programmable phone number, you can start building your virtual assistant! To make building with Autopilot easier, we'll install Twilio's official helper for Node.js applications next. If you’ve gone through one of our other Node.js Quickstarts already and have Node.js and the Twilio Node.js helper library installed, you can skip this step and get straight to creating your first assistant. To build and manage your assistant with Node.js you'll need to have Node.js and the Twilio Node.js helper library installed. Please follow the following instructions if you are using Windows, Linux or MacOS. All set! Let's create that assistant now. Now that you have Node.js and twilio installed, you can spin up a new assistant with a single API request. An Assistant is a conversational application or bot that you can deploy across multiple channels, like SMS and Voice. Each assistant is independent of other assistants you create and has a unique set of tasks that it can do. Swap the placeholder values for account_sid and auth_token with your Twilio credentials. Congratulations! You've just created your first virtual assistant with Node.js. The last line in this code prints out the Assistant SID to your command line terminal or shell. You may want to jot it down or copy it into a unique file – this value is what you'll use to add tasks and training samples to your assistant later on. A Twilio Autopilot assistant runs on tasks. A task is a set of actions your assistant needs to carry out when interacting with users. Tasks are modeled on something your end user wants or needs, and the specific things your assistant needs to do to help them out. An assistant usually has many tasks that power it. These could be simple tasks like confirm or cancel or more complex tasks like make-a-reservation. Actions instruct the assistant on how to perform a given task. When an assistant executes a task, it will run through all specified actions and then end the interaction. Most assistants will have many tasks that each contain multiple actions. You can imagine a virtual assistant that says something, listens for input, collects some data, and then hands off the caller to an agent. Your assistant doesn't have any tasks it knows how to do yet. We'll start by creating a simple task, hello-world, that says a brief greeting and listens for user input. Once again, update the placeholders for accountSid and authToken to use your unique values. You will also need to replace the placeholder value for the Assistant SID, UAXXXXXXXXXXXXXXXXXXXXXXXXXXXXXXXX, with the distinct SID for your new assistant. This is the SID value that our create_assistant.js code printed out – you can also find this value in the Autopilot section of the console. You've just created your assistant's first task! Before it's ready to go though, we need to add some training samples to the task and set it as our assistant's default task. Let's do that next. Now we need to train our assistant to listen for key words and phrases that show that our caller wants to hear a joke. To do this, we'll add some samples to this new task so that our assistant can distinguish it from the 'hello-world' task. A sample is the training data your assistant uses to understand your users' input. Samples define how people might describe a task when speaking or typing, and are necessary for your assistant to learn how to interact with your users. Once again you'll need to update the accountSid, authToken, and Assistant SID placeholder (UAXXXX....) to use your unique values. You've just given your assistant some training data for this task! Usually it's best to provide at least ten samples for any given task so that your assistant can map human input to the task. However, our hello-world task will serve a special purpose for our assistant: we'll set this task as the assistant's default tasks so that your assistant will say this phrase when anyone calls in. Because your assistant will use this task before a user starts interacting with it, it's okay to just have a few samples. Now your assistant knows how to handle an incoming call. All you have left to do is build the training model. Before your assistant can leverage the samples we just created, you'll need to create a Model Build. Creating a new Model Build will incorporate these changes into the machine learning model that powers your assistant. This code will kick off a Model Build for your assistant. Any time you create new Tasks or add a new set of Samples to your assistant, you should create a Model Build to train a new model using your data. Note that we've included the optional parameter uniqueName in this code. While not required, this helps us keep track of our machine learning model as we add tasks, samples, and other data to our Assistant. To test that you've given your assistant an inital task and trained the machine learning model, you're ready to connect it to your Voice-enabled Twilio Phone number. Let's learn how to do that next. Go to your Phone Numbers page in the Twilio Console. Select the phone number you own that you'd like to connect to this assistant. Scroll down to the Voice & Fax Configuration section. Replace <ACCOUNT_SID> and <ASSISTANT_SID> with your unique Account SID and the Assistant SID that your code printed out in the previous section. Now you can call the Twilio phone number you just updated and hear your assistant say "Hi there, I'm your virtual assistant! How can I help you?" However, if you ask your assistant for anything it will just repeat this message. It's time to add some more functionality to your assistant by teaching it how to tell a brief joke on-demand. Most of the time we'll want an assistant that can handle more than one type of interaction. So far our assistant is polite, but can it answer a question? We'll have our assistant handle one inquiry to start: "tell me a joke." Let's add a new task to our assistant by creating a "tell-a-joke" task with several training samples. Replace the placeholder values for accountSid, authToken, and the Assistant SID (UAXXXX...) with your unique values. Make note of the printed output – this is the unique SID for your new Task, you'll need it when you add samples to train your assistant next. Just as you did with the hello-world task, you'll need to add training samples to this new tell-a-joke task. Since your assistant needs to map human speech to this task, we'll make sure to give it the bare minimum of ten samples (and you can always add more). Again, update the accountSid, authToken, and Assistant SID placeholder (UAXXXX....) to use your unique values. You'll need to re-build the machine learning model for your assistant for these changes to take effect. At this point, your assistant is ready to tell a joke on demand! Before you test it out by giving it a ring, let's take a quick look at how we can programmatically query the natural language understanding of this assistant. Twilio Autopilot's Query API resource is the endpoint where Autopilot's natural language understanding analysis is performed. You can leverage this endpoint to check that your assistant correctly routes a phrase or word to the appropriate task. This code will print the name of the task your query triggered – you should see "tell-a-joke" printed to your command line. Now you can call your assistant to test it out! Call the Twilio phone number you connected to this assistant. You should hear your new greeting. Ask your assistant to tell you a joke however you like: you should hear your joke read back to you! Congratulations, you just built your first Twilio assistant with Autopilot! This quickstart taught you the basics of building a simple Autopilot-powered assistant, but Autopilot also powers bots and virtual assistants that can collect data and route users through complex flows. Learn how to make a more complex assistant that can gather and track user input in our Deep Table Reservations tutorial. Learn how to deploy your assistant to multiple channels, including SMS, Alexa, or Slack. We leveraged Autopilot's say and listen actions in this quickstart, but there's a lot more Autopilot can do! Learn about the other available actions here. Explore the full set of API reference documentation for Twilio Autopilot.